1.Begin by cutting four strips of 2cm wide Dovecraft Acetate. Vary the lengths to create an alternative design. Take apart your 8” Embroidery Hoop and adhere the strips around the inside of the largest hoop with Dovecraft Perma Fix Tape, ensuring to space out each strip of acetate. 2.Cut four, 40cm strips of Dovecraft yellow ribbon and adhere each length to the inside of the hoop, ensuring to space them out evenly. 3.Cut a 50cm length of the same Dovecraft ribbon. Holding all the ribbons together evenly, with the longest ribbon hanging in the middle, tie a knot at the top to secure all five ribbons. 4.Place the two hoops back together and tighten it so that it is secure. 5.Adhere your chosen Dovecraft Wooden Animals to the ends of each acetate strip with Dovecraft Perma Fix tape. Add a Wooden Animal to the bottom of the fifth ribbon you added. 6.Cut 4cm wide strips from the green Dovecraft felt. Make small, vertical cuts along the top edges to achieve the appearance of grass. Glue your felt strips to the inside and outside of your hoop. 7.Use the Dovecraft Flower dies to cut out a selection of large and small flowers onto the yellow and pink Dovecraft felt. Layer the two coloured flowers and adhere each one around your hoop. Stick a Belle and Boo Glitter Dot to the centre of each flower to finish. 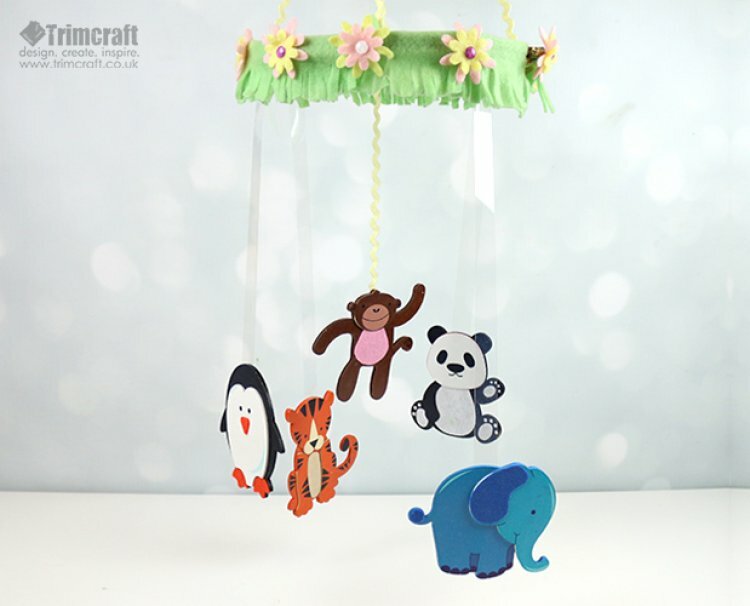 What do you think of our Dovecraft Wooden Animal Baby Mobile project? These loveable wooden animals are great to work with, and are fantastic for decorating a child’s room! We’d love to see your versions so remember to upload them to the project gallery and to #Trimcraft when uploading to social media!